Steve Olafson of Reuters is reporting that the Cherokee Nation is refusing to cooperate with the U.S. government, which warned that the results of the Sept. 24 Cherokee election for principal chief will not be recognized by the U.S. government if the ousted members, known to some as "Cherokee Freedmen," are not allowed to vote. After the Civil War, in which the Cherokees fought for the South, a treaty was signed in 1866 guaranteeing tribal citizenship for the freed slaves. The U.S. government said that the 1866 treaty between the Cherokee tribe and the U.S. government guaranteed that the slaves were tribal citizens, whether or not they had a Cherokee blood relation. African Americans lost their Cherokee citizenship last month when the Cherokee Supreme Court voted to support the right of tribal members to change the tribe's constitution on citizenship matters. The change meant that Cherokee Freedmen who could not prove they have a Cherokee blood relation were no longer citizens, making them ineligible to vote in tribal elections or receive benefits. "The Cherokee Nation will not be governed by the BIA," Joe Crittenden, the tribe's acting principal chief, said in a statement responding to the U.S. Bureau of Indian Affairs. Crittenden, who leads the tribe until a new principal chief is elected, went on to complain about unnamed congressmen meddling in the tribe's self-governance. There would be no meddling if the Cherokee Nation were not copying what white Americans did to slaves by denying them citizenship after they were freed, thereby preventing them from fully participating in this nation. The Cherokees, who should know better and do better, we might add, are now doing the same thing. 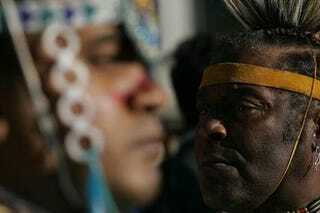 Blacks were slaves and guaranteed Cherokee Nation tribal citizenship after they were freed — period. To change the rules now is incredible, not to mention racist. It is ridiculously sad that the same racist ideology that drove white Americans to attempt to extinguish the native population is being invoked to ban blacks from voting in the Cherokee Nation. Now the tribe doesn't want to listen to the government. They had no problem listening when they were fighting with the Confederates so that they could keep their slaves. It sounds like Paulo Freire's Pedagogy of the Oppressed should be required reading for the so-called leaders of the Cherokee Nation. In other news: Oil-Pipeline Explosion in Kenya Kills 80.